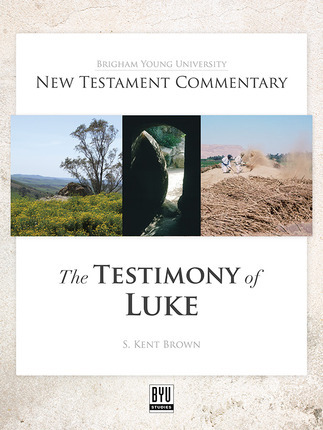 The Testimony of Luke by S. Kent Brown is now available in print at BYU Studies. The print version will soon be available on Amazon and can be requested at your local bookstore. The e-book is available through Deseret Book, Amazon (Kindle), and Kobo. Enthroned above all creation towers the exalted, glorified Christ. Descending into the darkest recesses of human agony and sin reaches the warm, caring Jesus. These two are the same person. Luke’s testimony introduces us to this man become God—God the Son. Not that this man is a mere man. No. As Luke emphasizes when presenting this person, he comes into our world already bearing a divine nature, already carrying divine qualities. Thus he arrives at his birth as Savior, as “Christ the Lord” (Luke 2:11). But he does not stride through mortality without challenges, both mental and physical. At one moment during his ministry, as he contemplates his future suffering, he declares, “I have a baptism to be baptized with; and how am I straitened [distressed] till it be accomplished!” (Luke 12:50). Months later, it is apparent that he has resolved his fears and worries when “he went before” the crowd of his disciples, pushing the pace on the long, steep climb from Jericho to Jerusalem, ready to face his foreordained destiny in the capital city. Only Luke’s testimony captures Jesus’ inner transformation. The most distinguishing element of this line-by-line and word-by-word commentary is the introduction of distinctive Latter-day Saint scriptures to cast light on various passages in Luke’s Gospel—the Book of Mormon, the Doctrine and Covenants, and the Pearl of Great Price. It is not surprising, therefore, that the commentary features elements of Luke’s gospel that interest Latter-day Saints, although it focuses primarily on topics that arise in the text. For example, the gap in Luke’s record concerning the Savior’s activities in the world of departed spirits while his body lies in the tomb is of particular interest to Latter-day Saints because an important set of doctrines arises from his activity there. In addition, Latter-day Saints emphasize the sacred and enduring nature of the family. This commentary highlights passage after passage that feature the importance of the family. For example, Luke opens his story by turning our gaze upon a childless couple, Zacharias the priest and Elisabeth his wife. With heaven’s help, this couple become parents with the birth of their son John. Further, more than all other gospel accounts, except that preserved in 3 Nephi 11–26, Luke captures the compassion and love of the Savior. Such sweet concern manifests itself particularly for the downtrodden and those forced to the margins of society. Within this frame, most notable is Jesus’ compassion for women and children, a compassion that springs into view in story after story. This aspect of Luke’s gospel does not derive from some special interest on his part nor from his sources. Jesus’ compassion brims over again and again, a dimension of his life that is truly genuine and cannot be hidden. For instance, it manifests itself in his declaration about divorce, that gives back dignity to women caught in its web (see Luke 16:18), and in his heartfelt appeal to the women and children of Jerusalem as he is led to the cross (see 23:27–33). As a companion dimension, when setting the stage for his report, Luke introduces us to Elisabeth and Mary, who are recipients of God’s gracious acts, of God’s compassion both for them and, through them, for the rest of humankind. For God’s love is bundled into the arrival of their expected children and into the children’s respective ministries. In sum, within these stories, Luke discloses the deep, divine love that runs through his narrative of the Christ. Prof. Brown’s Commentary is, to put it bluntly, an astonishing achievement. . . . I learned a lot from it, and that learning took place on multiple levels. . . . Prof. Brown’s book is a virtuoso performance. . . . The focus on family is not surprising, given that Mormons are well known for putting family at the center of their religious practices, but Prof. Brown’s commentary is the first, as far as I know, to show how fruitful it is to put family at the center of the reading of the Gospels. Luke’s Jesus, in Brown’s hands, is not the solitary hero, sadly misunderstood, of much modern biblical theology, nor is he a downtrodden man who is born into solidarity with the poor and dispossessed. This is a Jesus who is from a stable, loving, and quite traditional family, who is well educated (knowing four languages, Aramaic, Hebrew, Greek and Spoken Egyptian), who rises early in the morning to worship and work, and who is a lover of conversation, indeed, a consummate talker who always has an appropriate story on hand to deal with any situation. The result is that details of the Gospel come alive in new ways, like the easily overlooked mention that Peter and his wife have been taking care of Peter’s mother-in-law (Luke 4:38–39). For the full review, click here.